This one is called Mage One. Yes I know. Lame name, but I was caught off guard by having to name the miniature. It is also one of my first attempts at object source lighting. I love this one and he won me a bronze metal. His name is Boris because I had a little bit more time to name him as he was the third one I entered. Vengeful Angel of Mercy. This miniature earned me a silver in which I pretty much hugged all the presenters. Well I was happy -- My hope was to beat my bronze last year and I did it. Some of you may have noticed that the base she is on is different in two of the pictures. Why? Well the top one was taken before reapercon and slightly unfinished. I damaged the piece on the way home so I needed to repair it and since I had gotten some negative feedback from the clear tube I used as a support I decided to replace it with a solid piece. She is also a bit higher and at a slightly different angle. Not sure which one I like the best but she occupies a special place in my display case. This one is named Penny the Pirate. Why? Two reasons: 1) I had more time to name this one because I knew about the naming from the previous year. Forewarned is fore armed. 2) The real reason she is named Penny is because a good friend kept asking me to put a penny in the picture so she could get an idea of scale. I kept telling her that I put a "Penny" in the picture for scale. Yes sometimes I just like to amuse myself. This one is called Leap of Faithe and its my diorama entry. Oh yeah she earned me a bronze. It would have done better if I had her leaping onto something but I kind of like the idea that you don't know what she is leaping into. She has faith that it will turn out well... Get it? Okay I am amusing myself again. This is my entry for ReaperCon 2015. I call him Man Ta'core because of the pun. Those of you who follow my blog (both of you :) ) know that I struggle with this guy a bunch. I the end I think I just got frustrated with it and took some short cuts in the process. Looking at it now I really like the way that it came out and I can see some things that I really want to fix. Some higher highlights on the wings for example... Maybe some more red in the base to tie the base and the figure together. 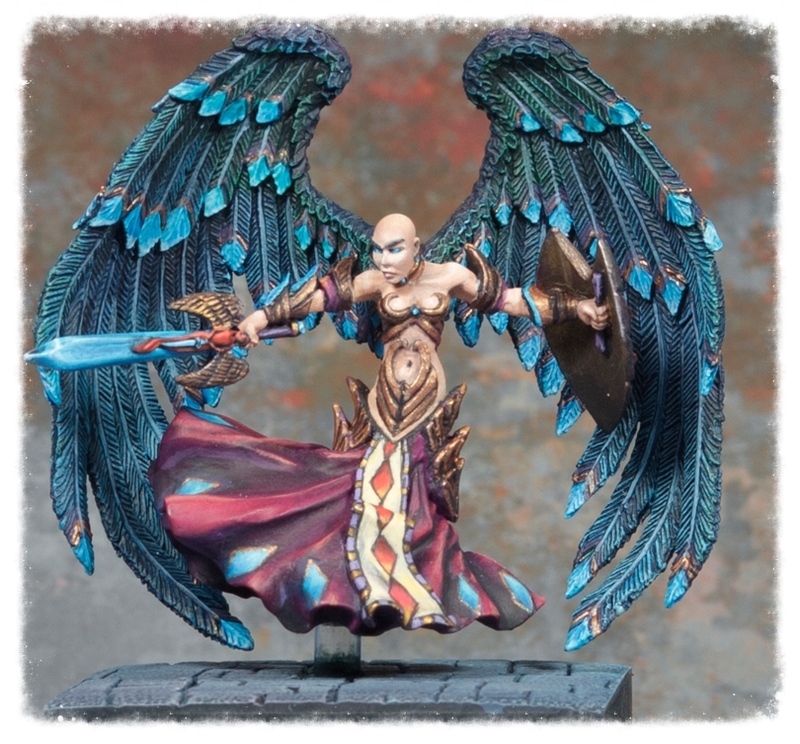 This is a beautiful miniature from Dark Sword.